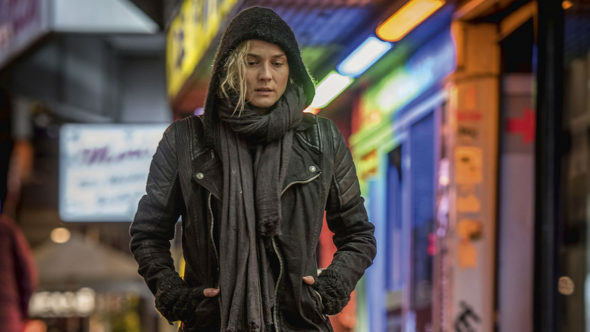 Director Fatih Akin returns to an overtly political palette with In the Fade (Aus dem Nichts), and leans on a powerhouse lead performance from Diane Kruger to keep the film above standard thriller fare. Kruger, starring in the first German language film of her career, is Katja, a German woman whose Turkish husband, Nuri, (Numan Acar) has rehabilitated himself after a stint in prison for dealing drugs. On the way to meet a friend one morning, Katja visits Nuri’s office to drop off their young son, and never sees them alive again. They are the only casualties in what appears to be a targeted homemade bombing, and Katja’s recollections of a random woman she saw outside Nuri’s office become key in the trial of a neo-Nazi couple accused of the murders. As a grieving mother looking for justice, Kruger delivers a masterful turn, making the weight of emotional turmoil feel achingly real. Katja struggles to exist in the haze of her heartbreak, juggling grief, bickering family members and a growing need for revenge. Kruger draws us in immediately, so much so that we feel the release when her quiet resolve finally erupts in emotional outburst. The film’s third act, “The Sea,” has trouble delivering on the promise of all that Akin has cultivated in the first two (“The Family” and “Justice”). Events begin to follow a more conventional path, and though the outcome is striking, anyone familiar with Hollywood thrillers may find the narrative choices curious. Worth seeing? Absolutely, and Kruger’s performance will likely linger even when the film’s voice does not.